The Dynamic Host Configuration Protocol (DHCP) Reservation feature allows the router to reserve the lease of an IP Address for use of a specific device on your network, effectively ensuring that the router does not assign the IP Address to other devices in the network. This is helpful when managing multiple devices such as print servers, web cameras, network printers, or game consoles. 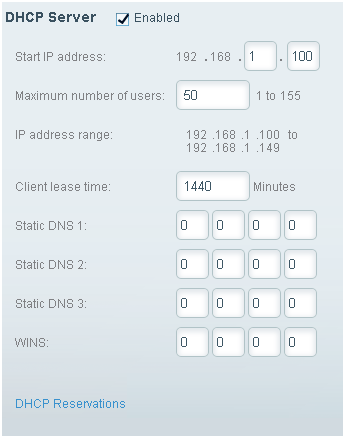 IMPORTANT: The IP Address has to be within the DHCP Reservation range. This is because you cannot set an IP reservation outside the DHCP range. QUICK TIP: The DHCP Server should be enabled because disabling it will make your router work as a switch, allowing only one (1) computer to have Internet access. In cases when the DHCP server is disabled but IP Addresses are still assigned, it is the router's Network Address Translation (NAT) that translates these addresses coming from your modem. QUICK TIP: You may change this address but you will have to reconnect devices currently connected to your router since it will have a different IP Address. Subnet mask – This is the router's subnet mask. It's used to divide a network into subnets so information can be routed correctly to your computers and devices. Your Internet Service Provider (ISP) will provide you with the subnet mask setting needed here. Maximum number of users – This is the total number of devices that can connect to your router. This number can't be greater than 253 and by default is set to 50. Static DNS 1 - 3 – Domain Name System (DNS) is how the Internet translates a domain or website name into an Internet address or URL that you can access. Your ISP will provide at least one DNS server IP Address. You can enter up to three (3). WINS – The Windows Internet Naming Services (WINS) is responsible for managing each computer's interaction with the Internet. If you use a WINS server, enter that server's IP Address here. Otherwise, leave this blank. DHCP Reservations – This is where you can assign a unique, fixed IP Address to a specific device on your network. This is helpful when you want your device to have the same IP Address every time it connects to the network. Under DHCP Server, click DHCP Reservations. This will show you the list of devices connected to your network. Select the device you want to add and click Add DHCP Reservation. Device Name – This is the name of the device you want to add. Assign IP Address – This is the fixed IP Address it will get every time it connects to the network. To: MAC Address – This is a unique identifier associated to a device. To know how to get the MAC Address of your computer, click here. QUICK TIP: You can click on Edit or Delete to configure your DHCP Reservation List. Edit will allow you to change the Device Name, Assign IP Address, and To: MAC Address. Delete will remove the device from the list. To save the changes you’ve made, click . Your device will automatically get the assigned IP Address every time it connects to the network. It will also no longer experience any IP Address conflicts with other devices in the network. 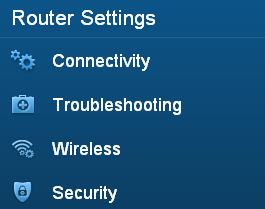 Aside from configuring the Linksys Smart Wi-Fi Routers’ advance features, you can still do more. By simply connecting additional devices, you can now extend your wireless signal to accommodate the hard-to-reach areas at home and even to connect more devices (both wired and wireless) for gaming or entertainment. Click on the links to know more about these new products.